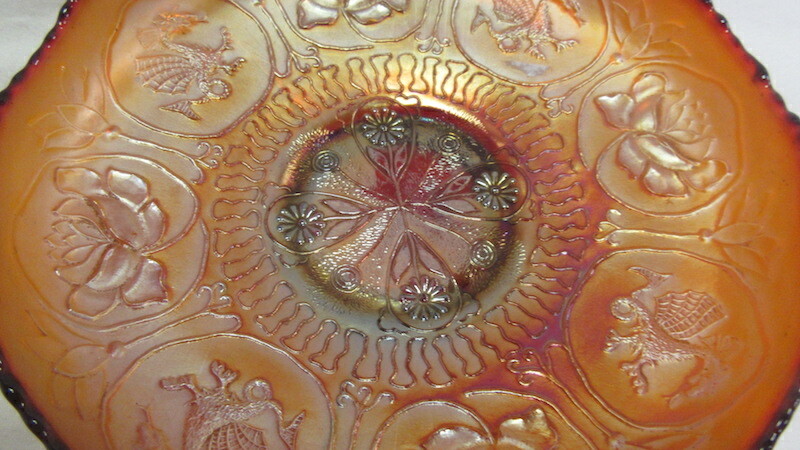 Fenton made several dual theme patterns. 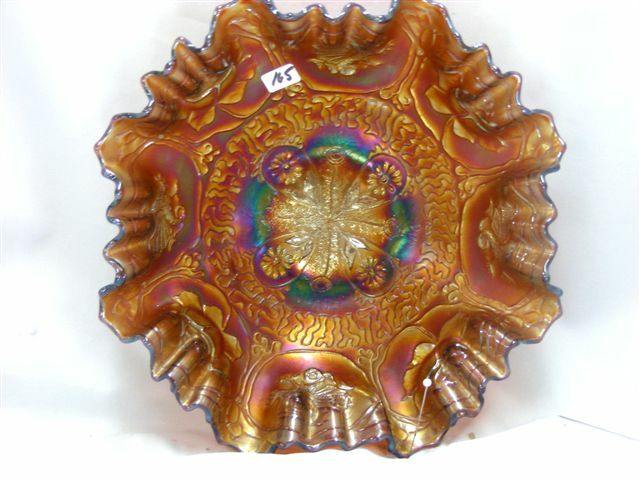 If this doesn't look like your pattern, check Dragon & Strawberry, Peacock & Dahlia, and Peacock & Grape. 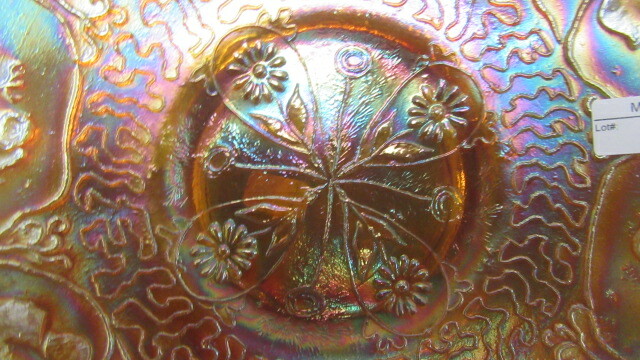 This pattern is seen in perhaps the widest range of colors in the Carnival pantheon, including the highly desirable red in an ice cream shape as shown on the left. 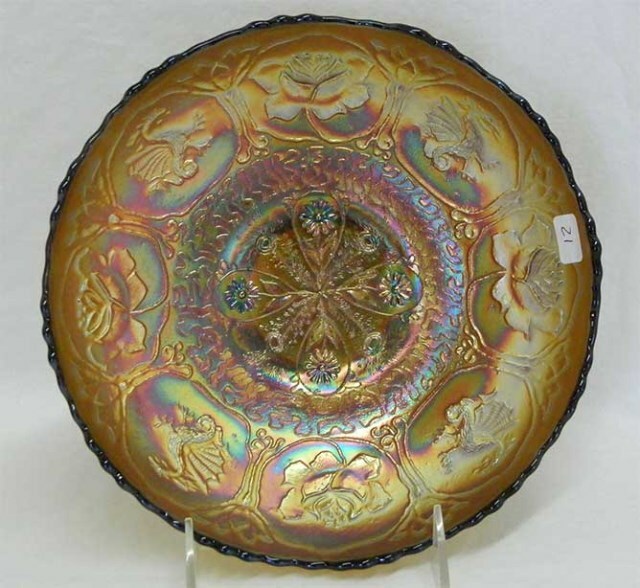 It brought $4,100 at a 1996 auction. 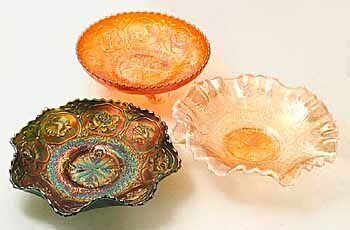 On the right are three bowls: a ruffled green (the iridescence makes it look purple), a spatula-footed ice cream shape in marigold, and an opalescent three-and-one edge with pastel marigold iridescence. 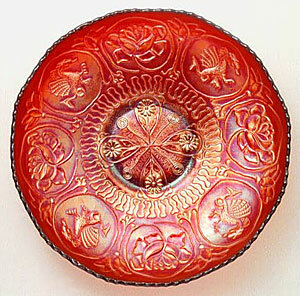 Bowls measure 8 1/2 to 9 inches. 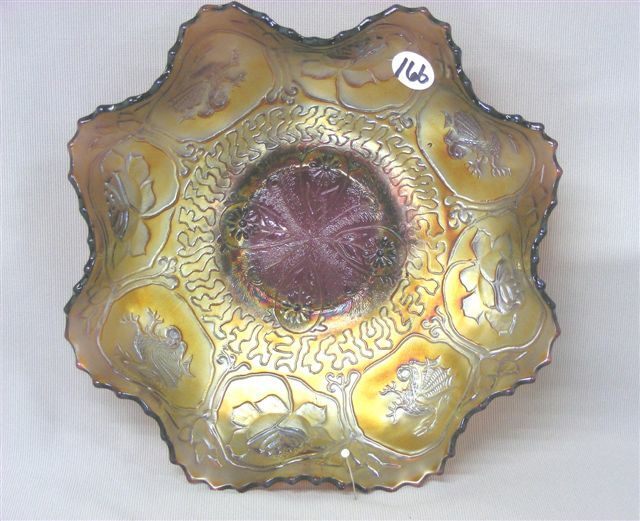 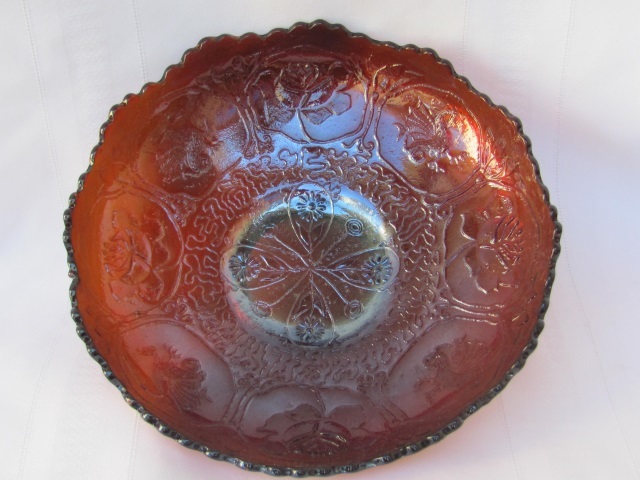 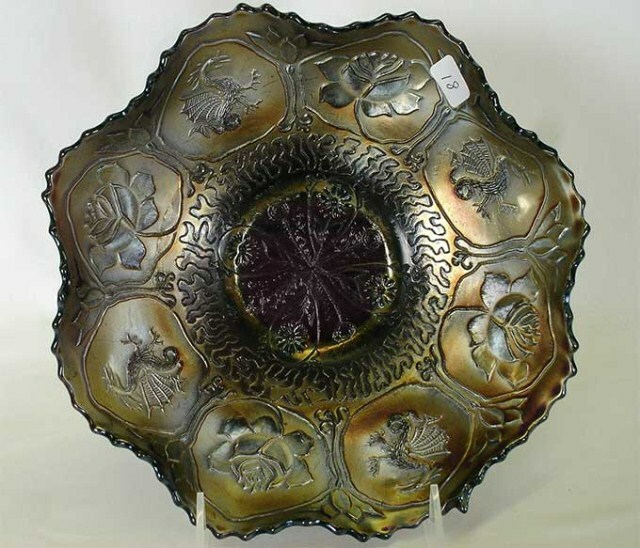 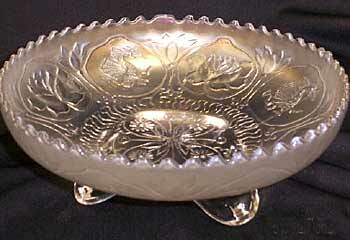 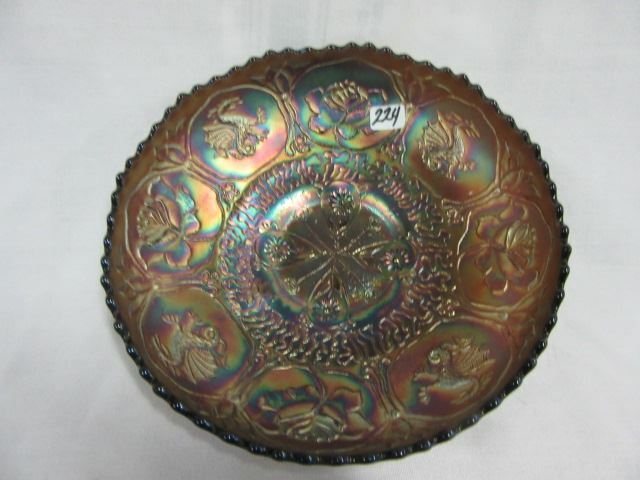 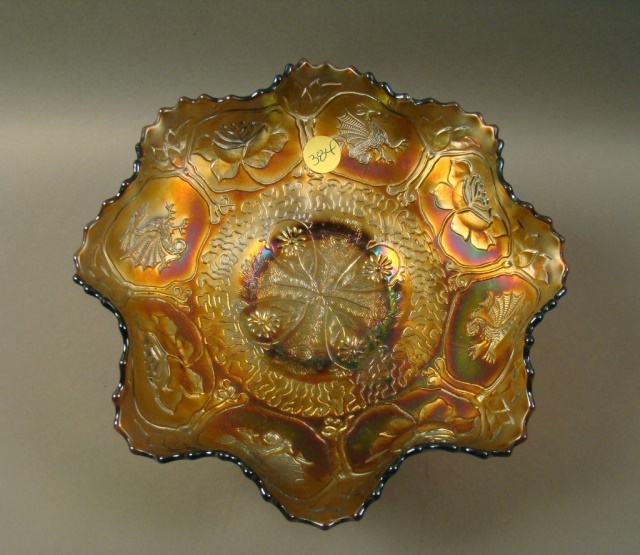 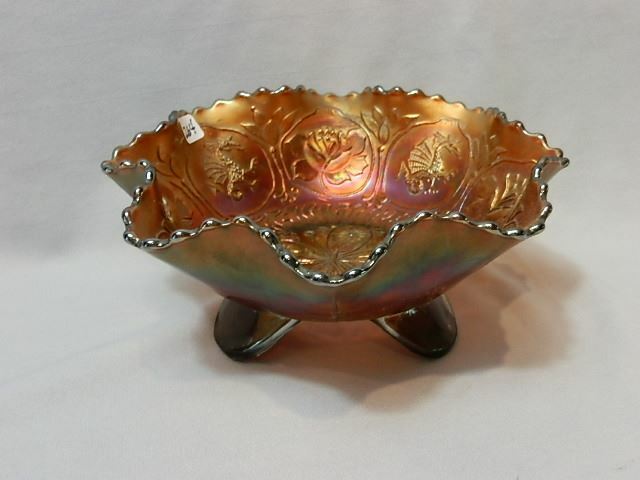 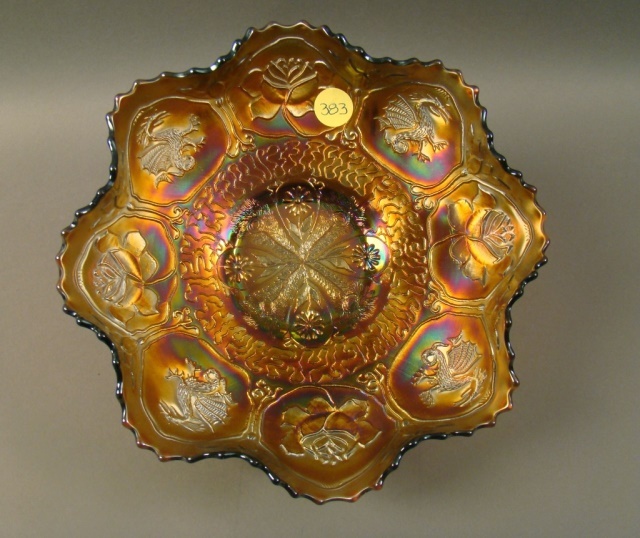 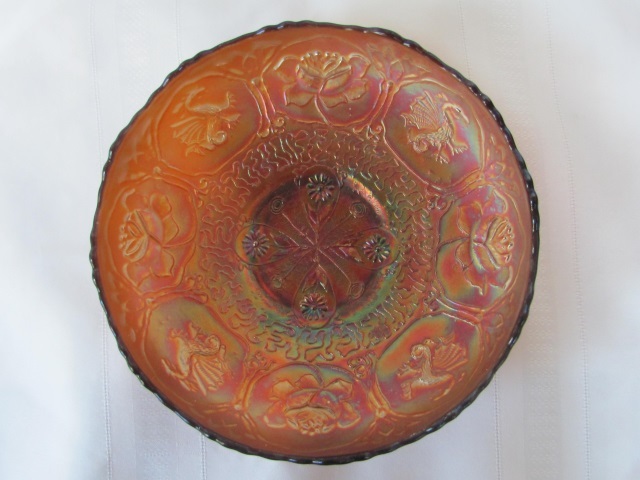 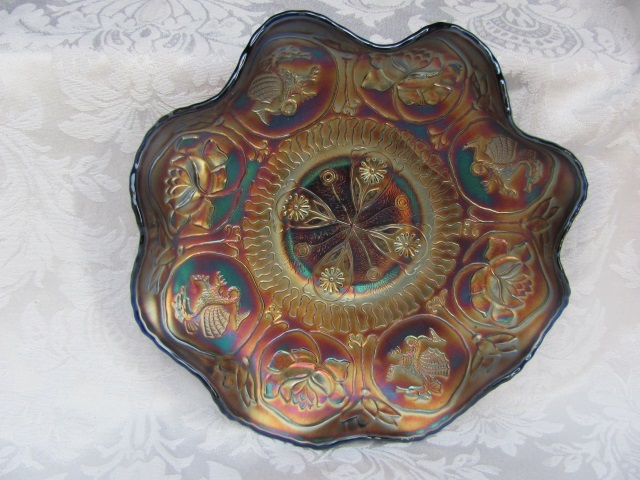 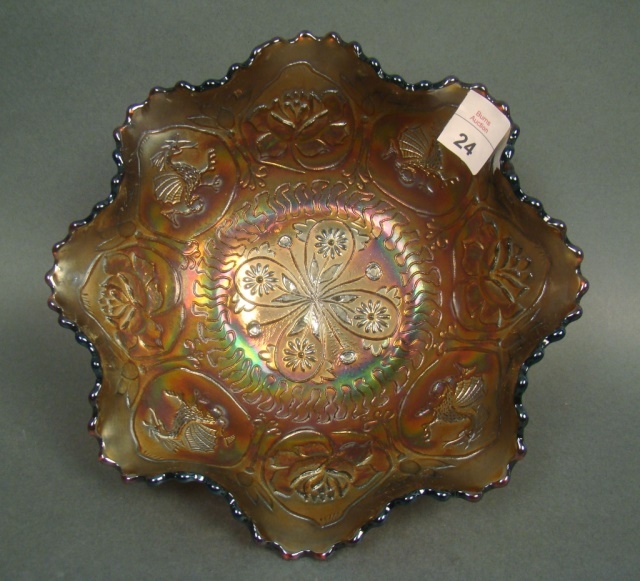 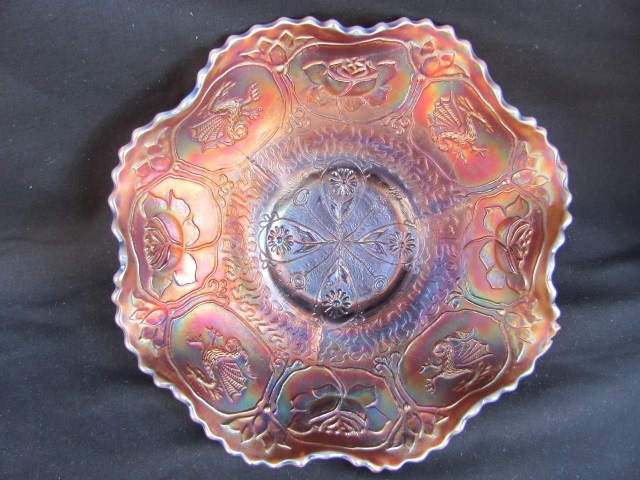 In January of 2003, the www.cga newsletter had reports from a number of readers about the Dragon and Lotus nut bowls (the rarest shapes in the pattern). 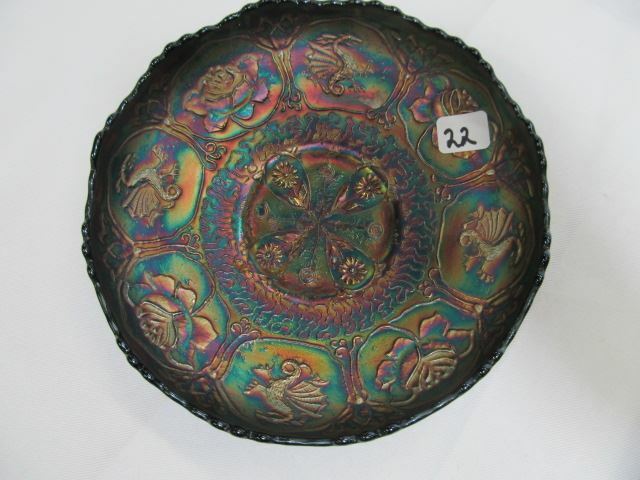 They were reported in both the spatula footed and collar based and the colors reported were amethyst, blue, green, and marigold. 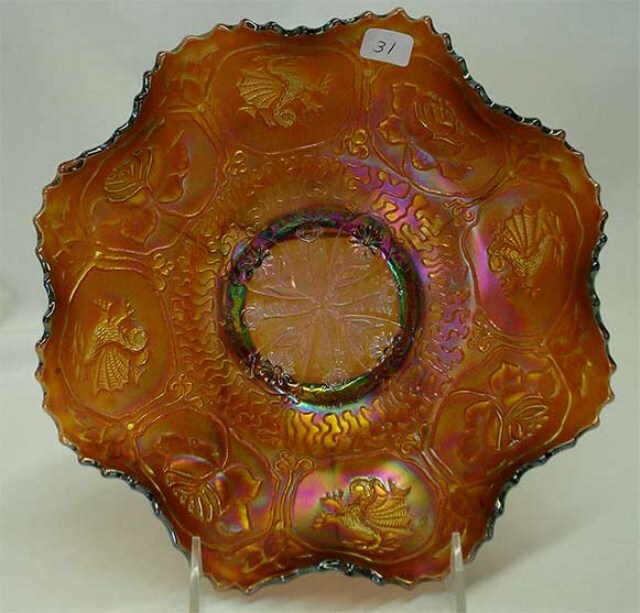 In March of 2003, Ardonna Bucher, consumate collector of all things Dragon and Lotus, added some interesting info. 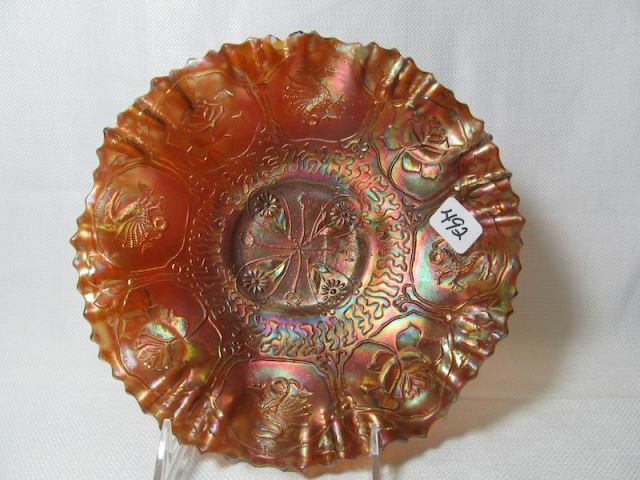 She says there are about 4 peach opal spatula footed plates and a lime green opal collar-based plate. 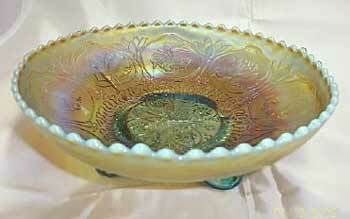 As for bowls, Ardonna has a cobalt blue opal ice cream shape bowl and a white spatula footed in the ice cream shape. 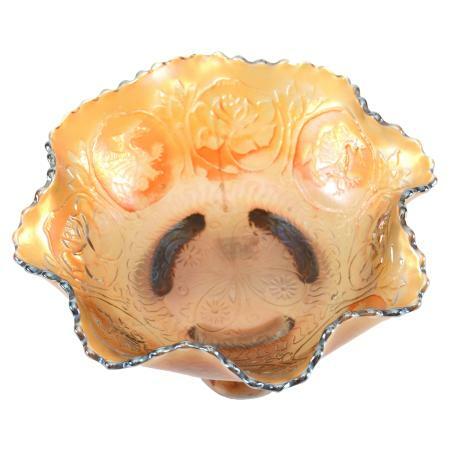 She knows of a ruffled collar-based bowl in white. 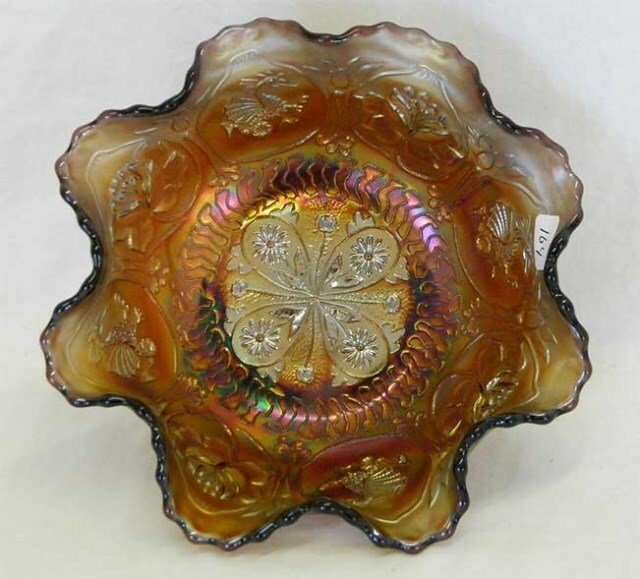 And she reports a bowl in root beer color–a brown or very dark amber. 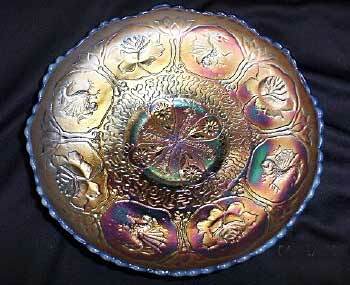 Thanks, Ardonna. 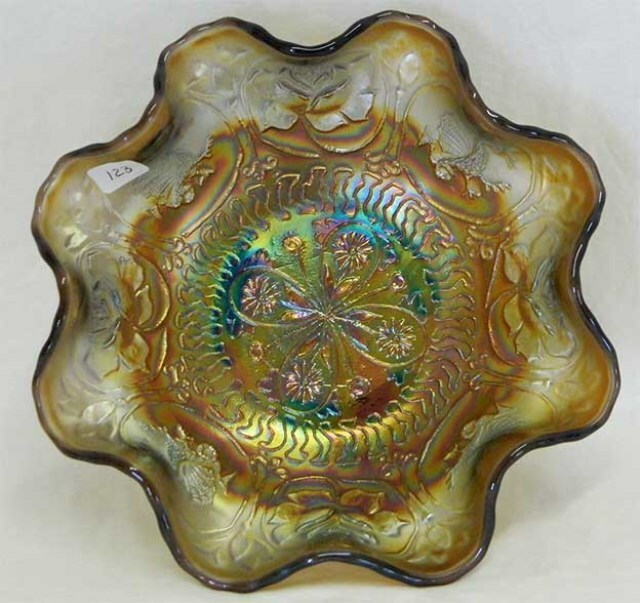 That makes at the very least 31 different colors in this pattern. 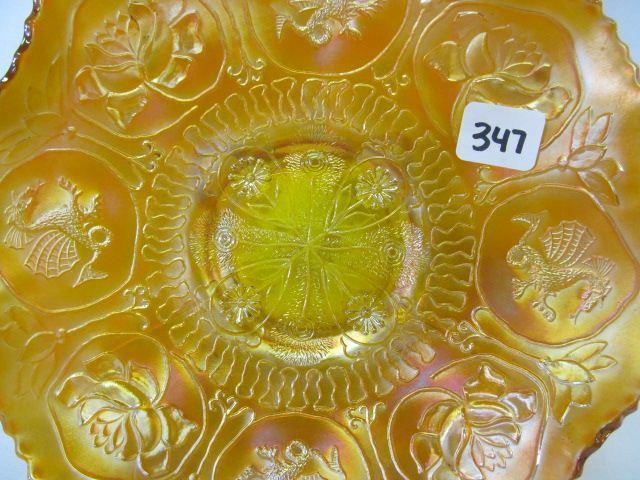 I can't think of any other pattern with anything close to this total. 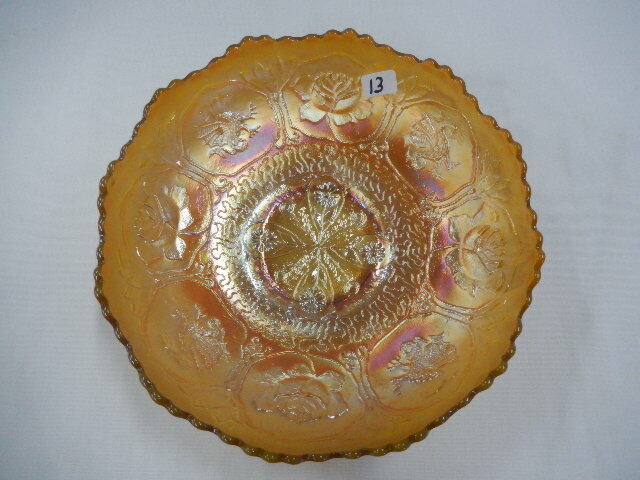 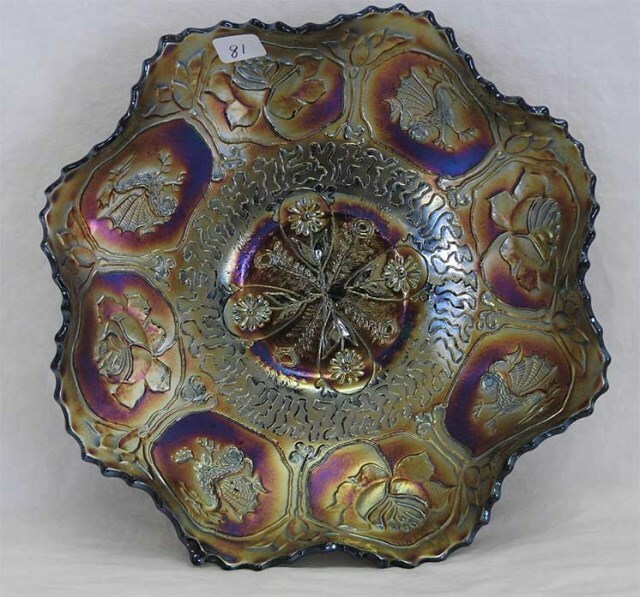 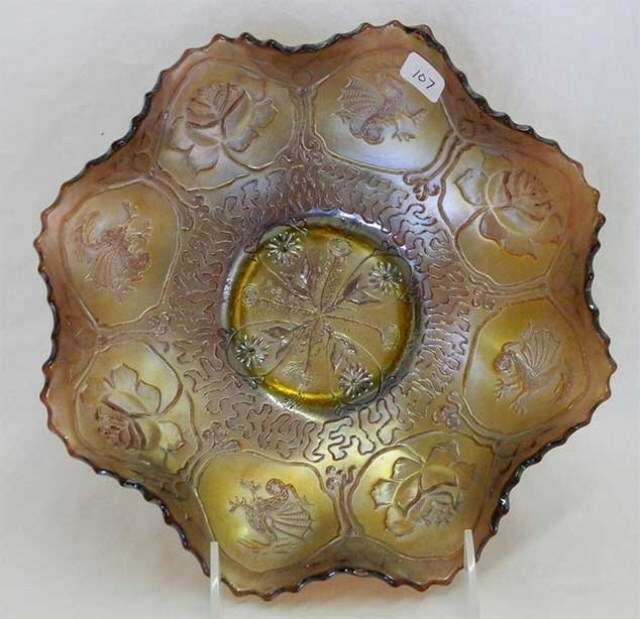 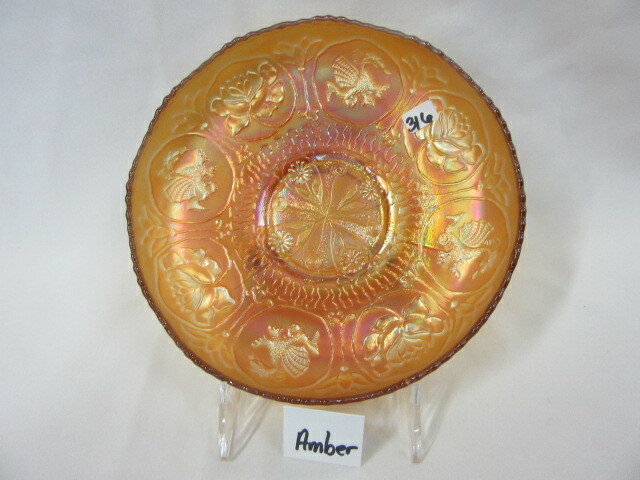 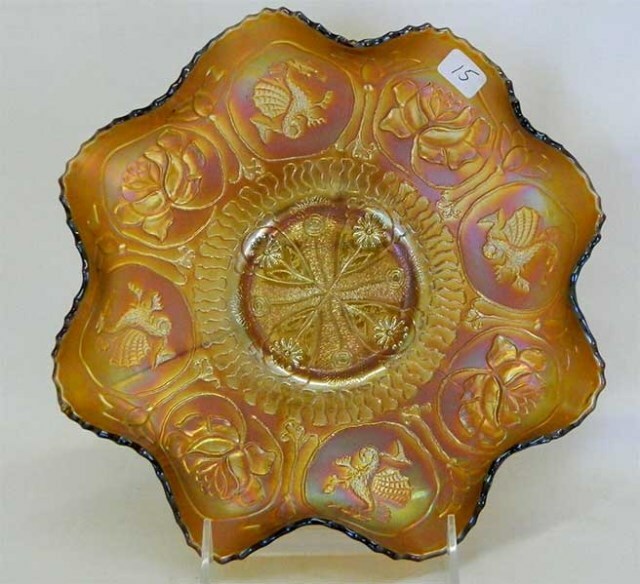 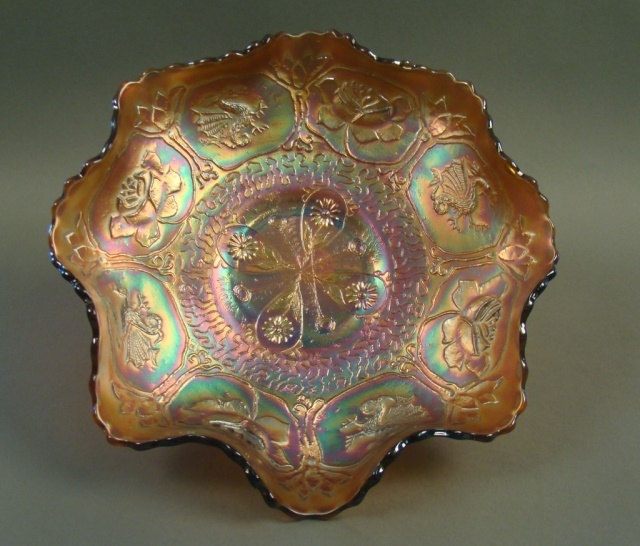 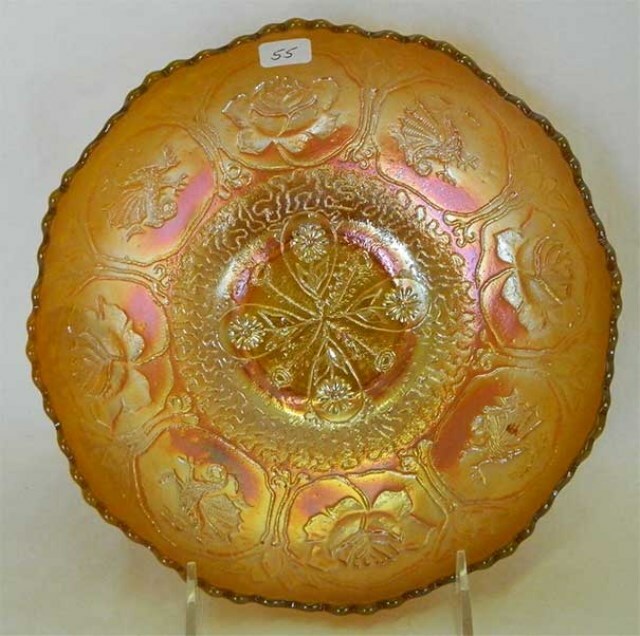 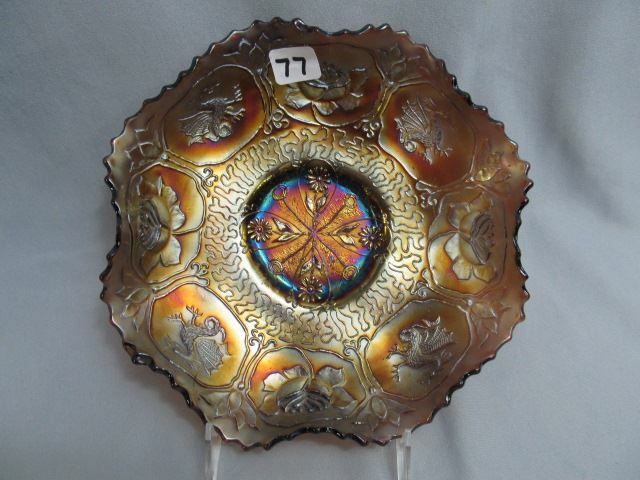 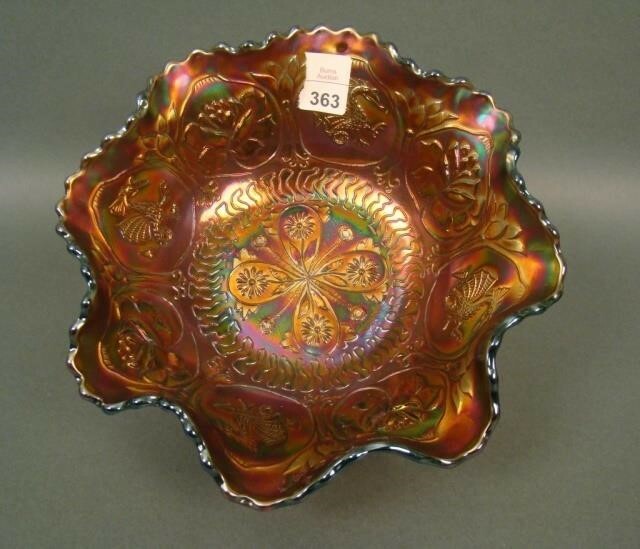 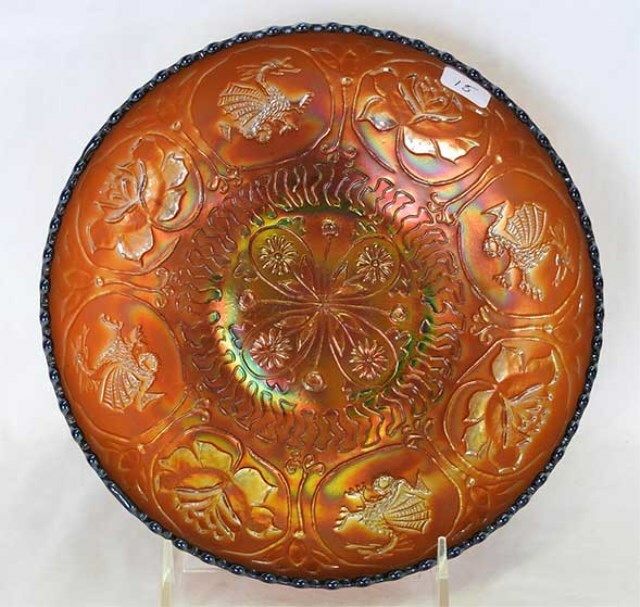 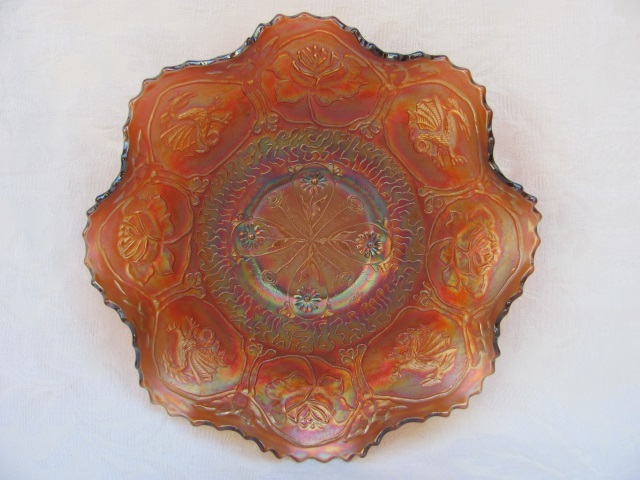 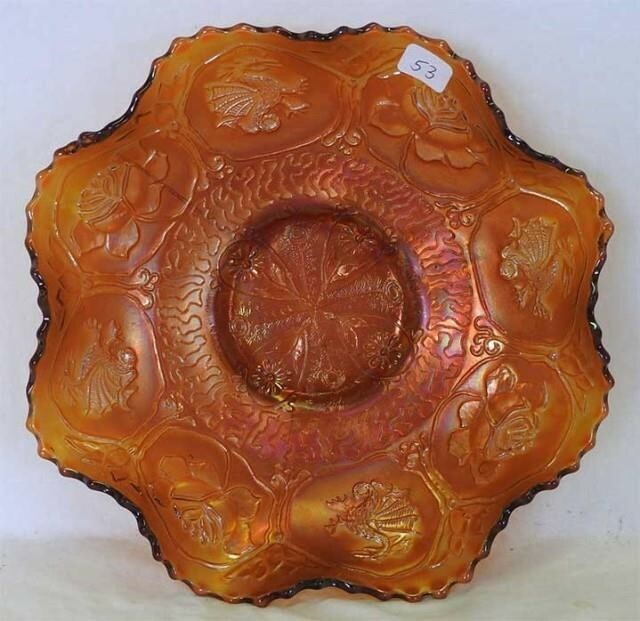 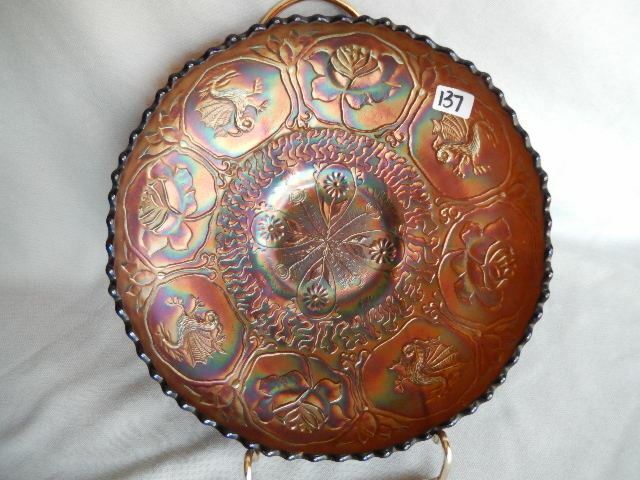 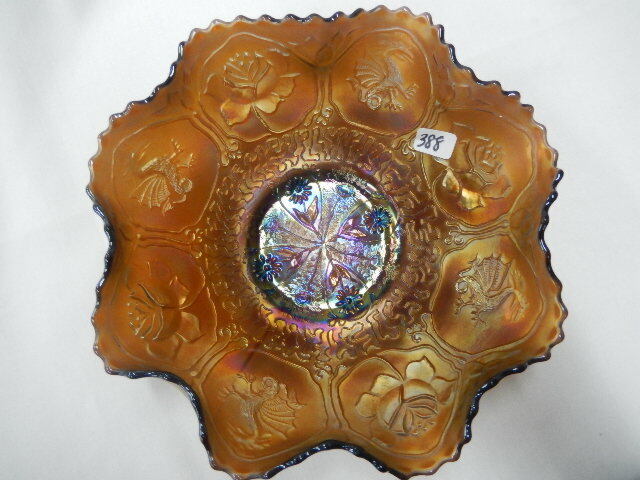 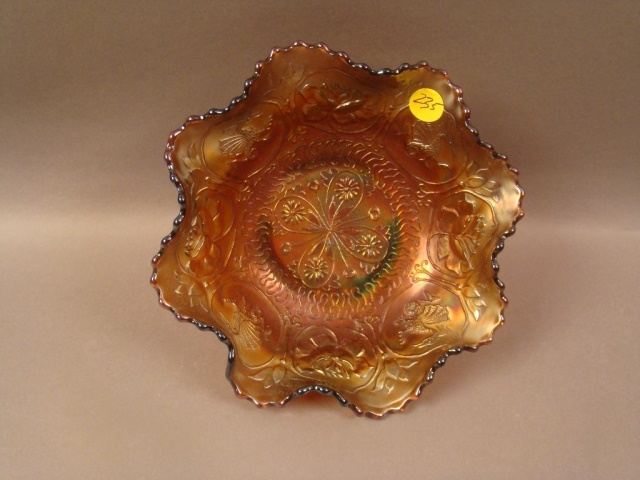 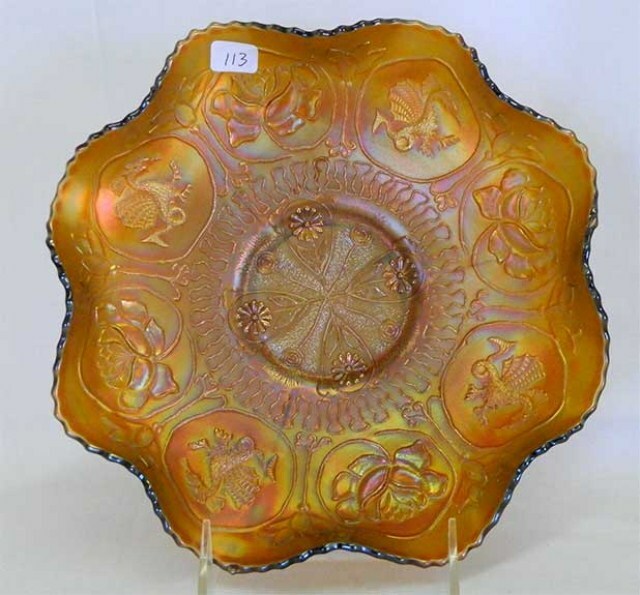 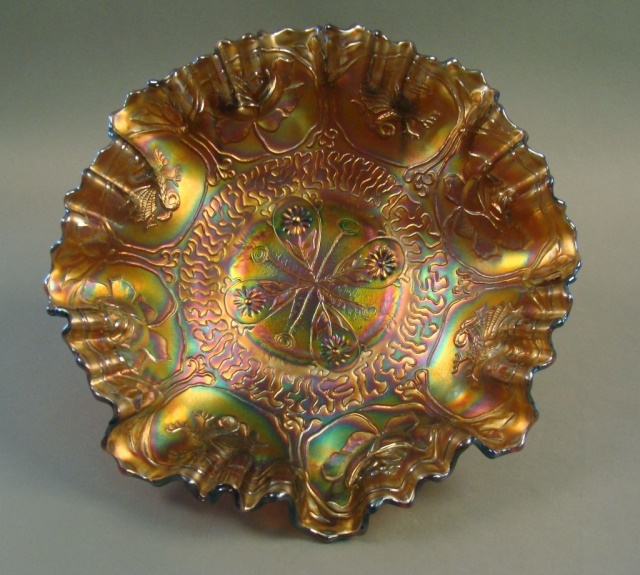 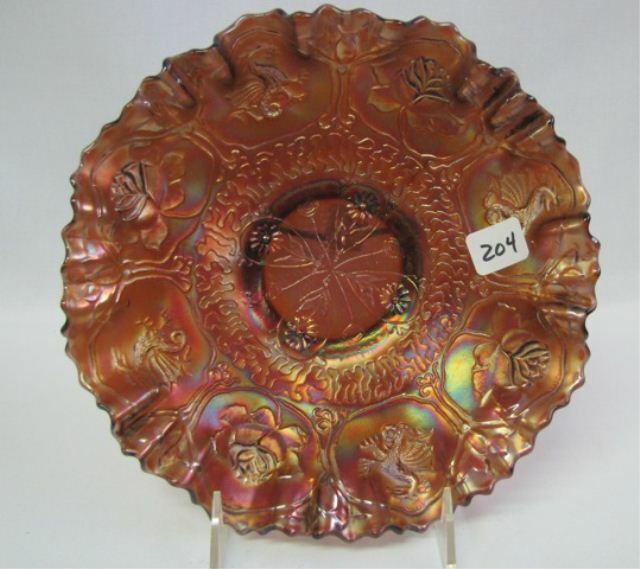 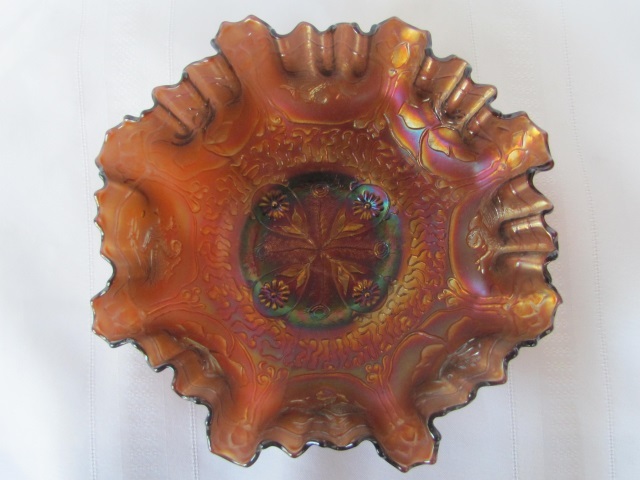 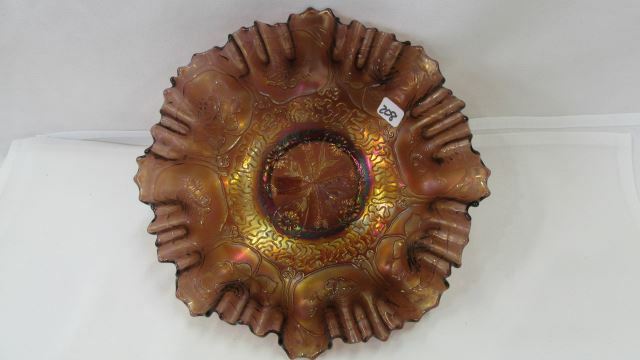 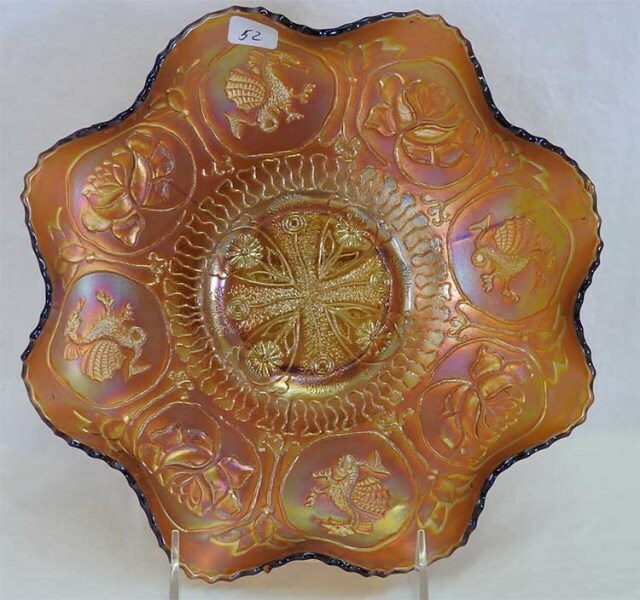 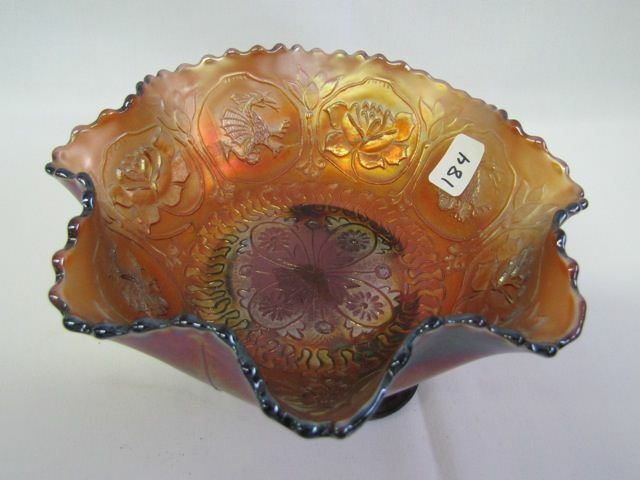 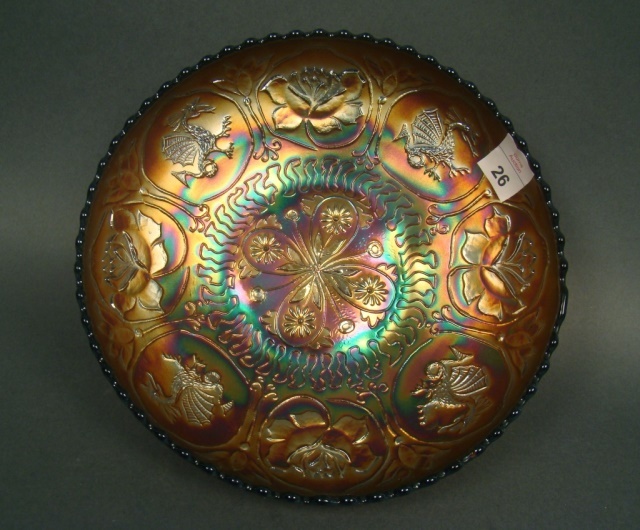 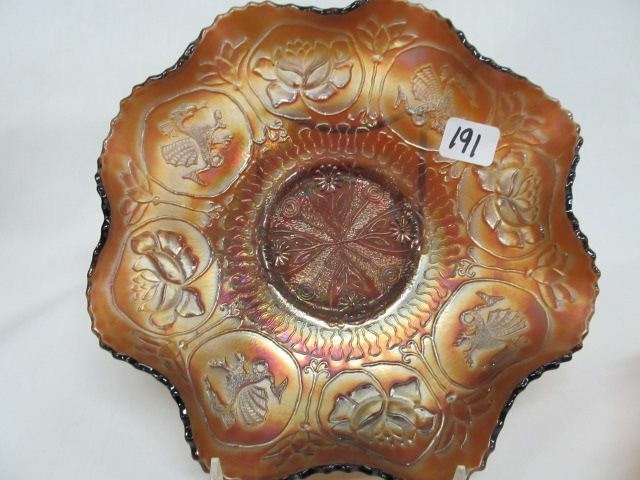 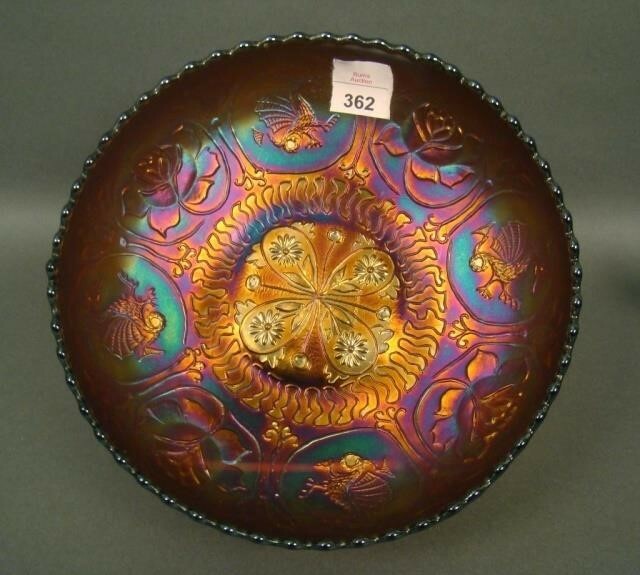 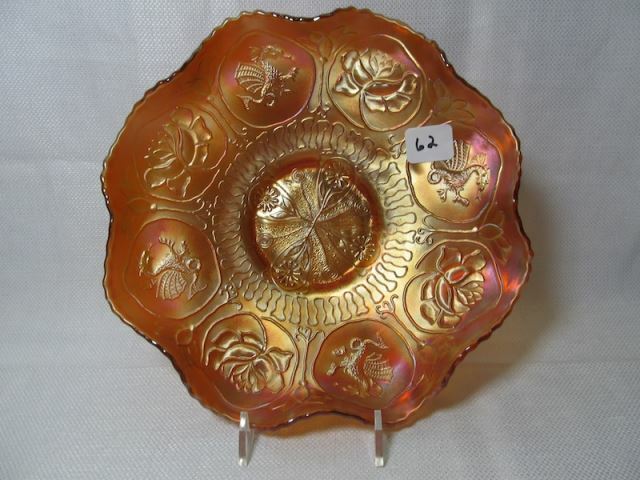 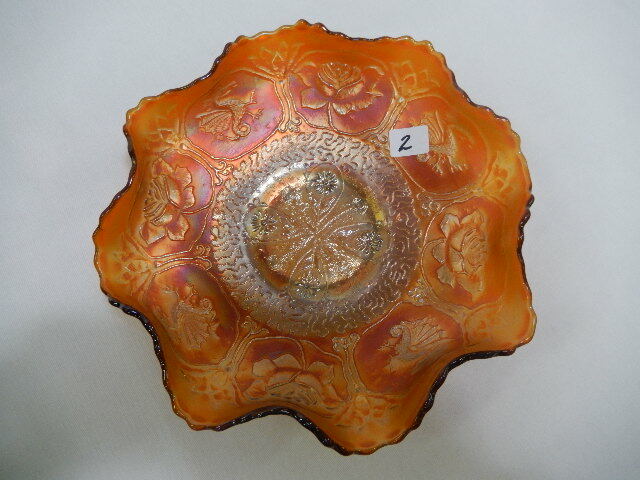 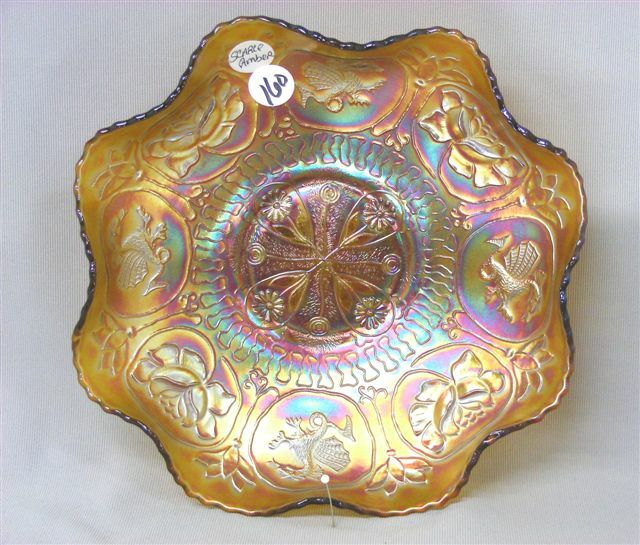 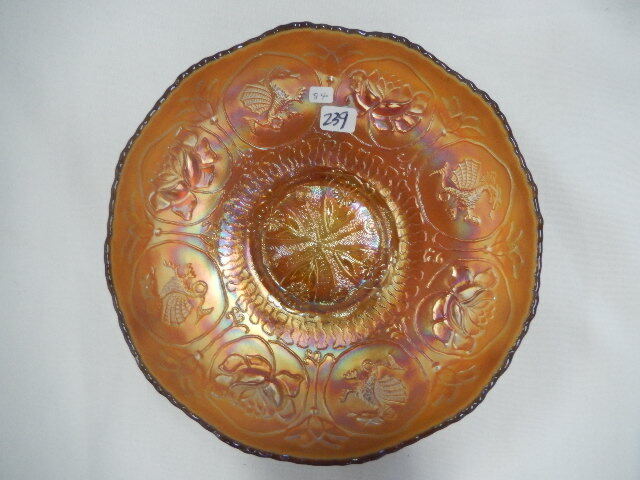 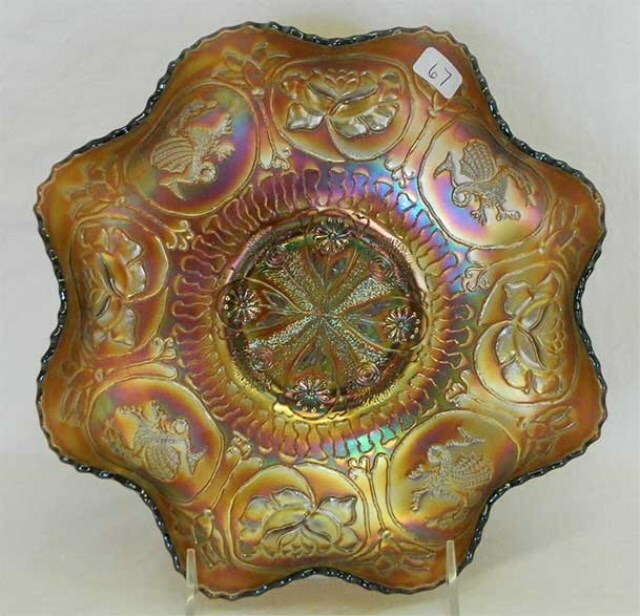 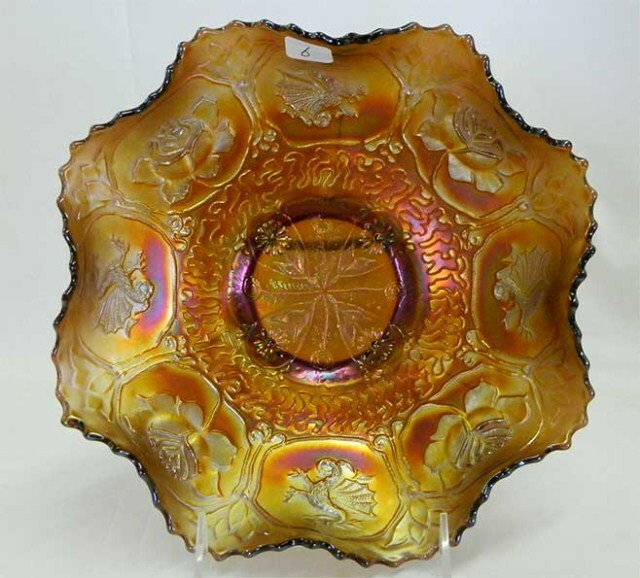 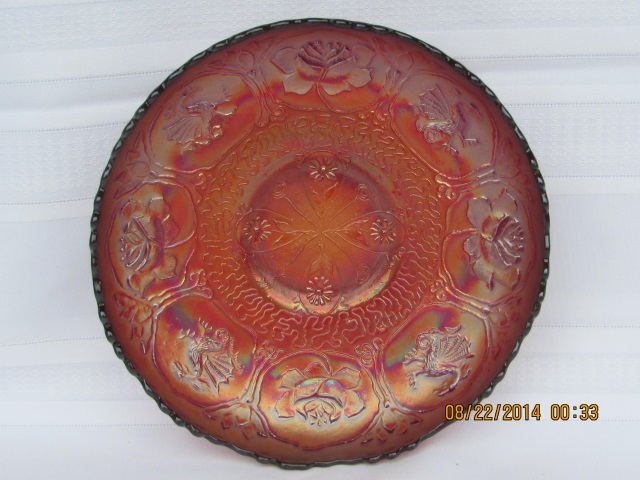 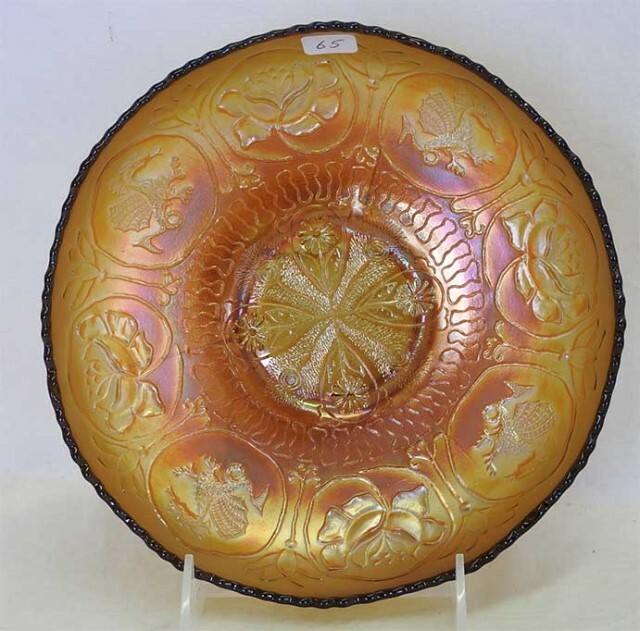 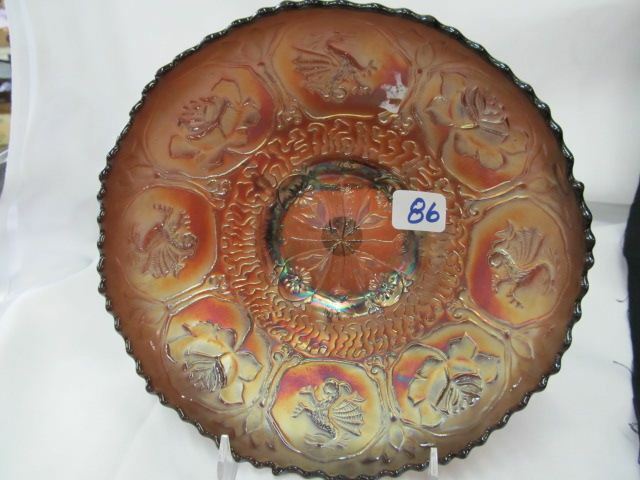 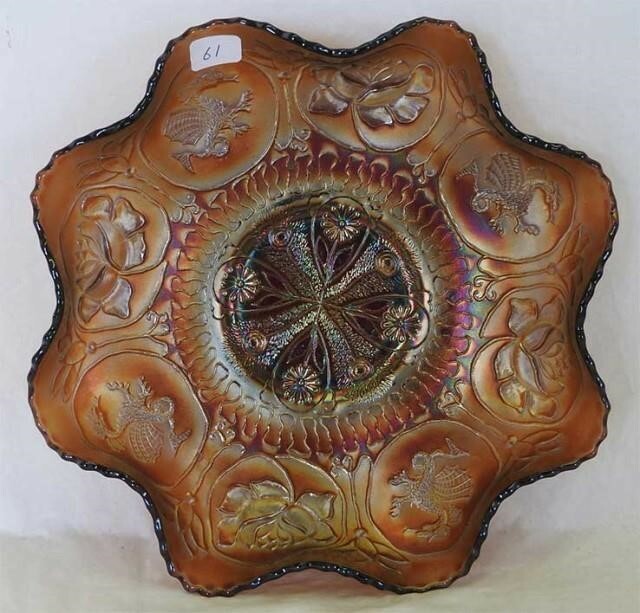 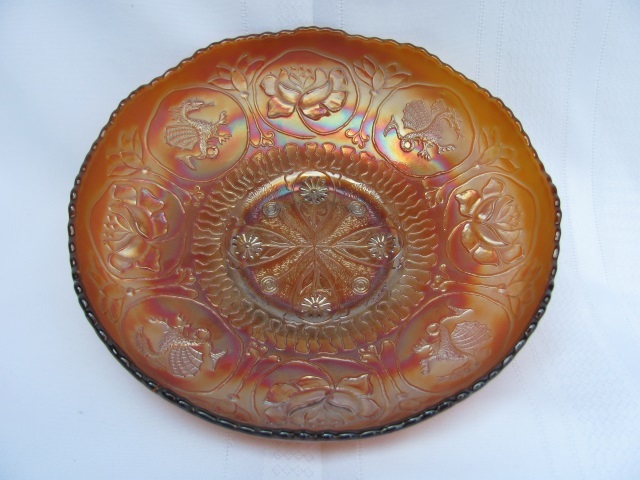 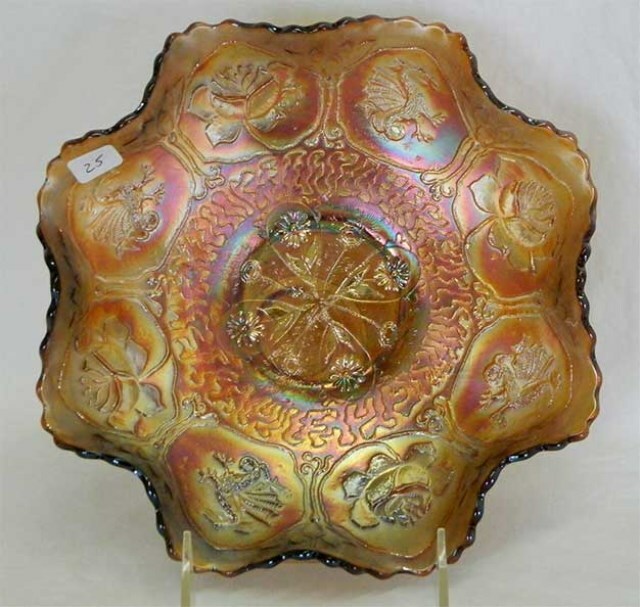 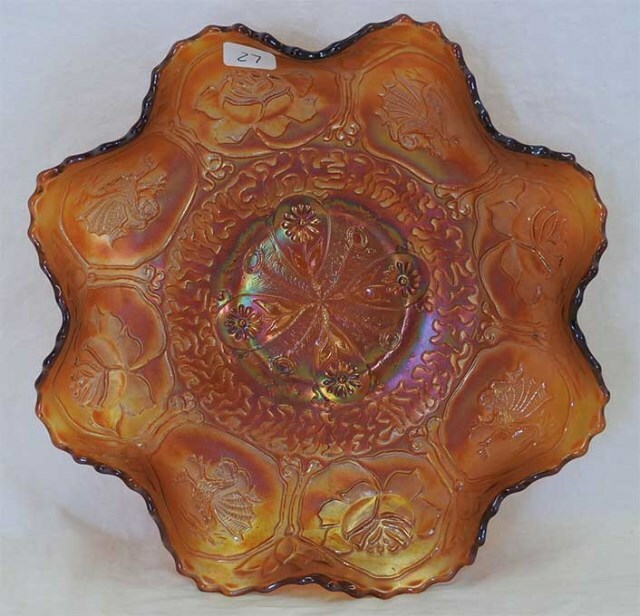 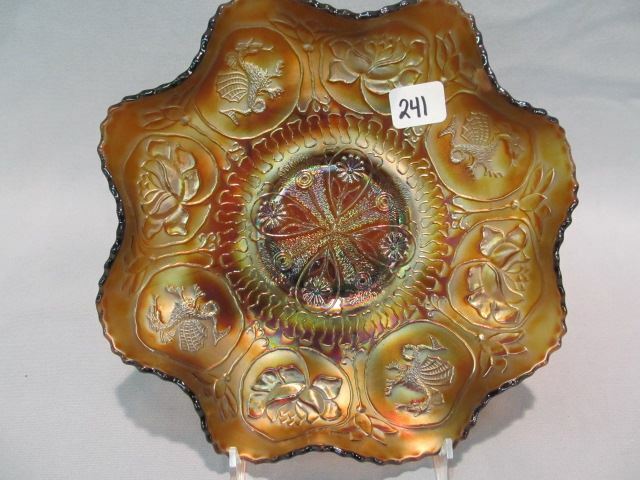 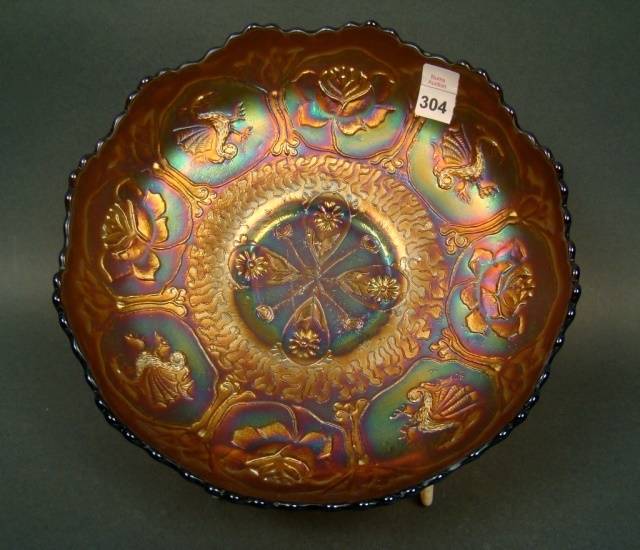 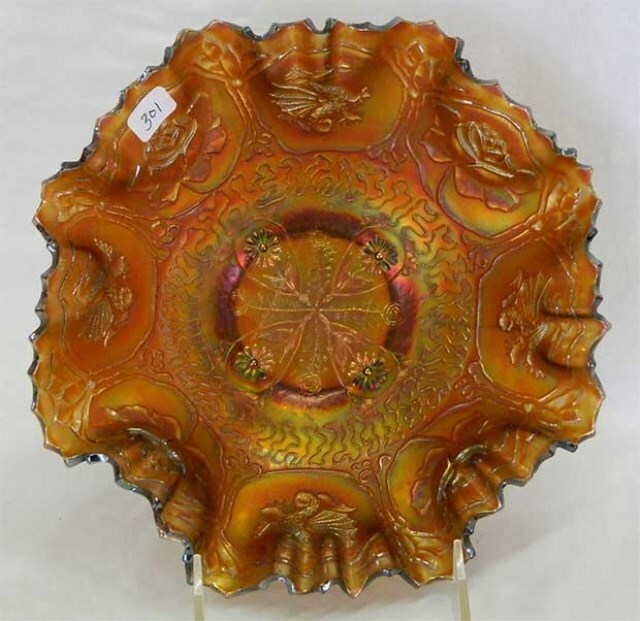 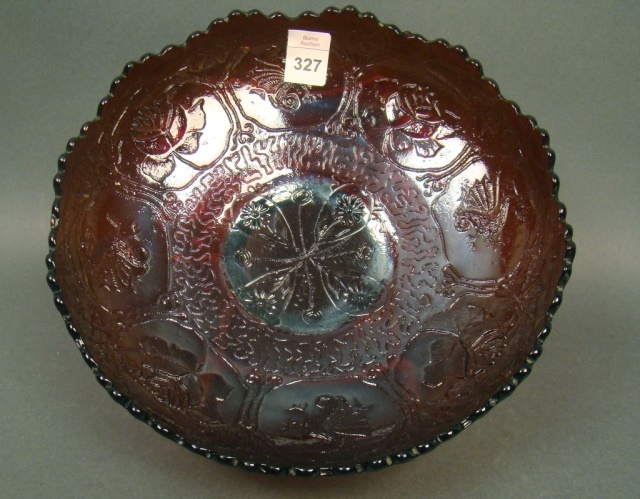 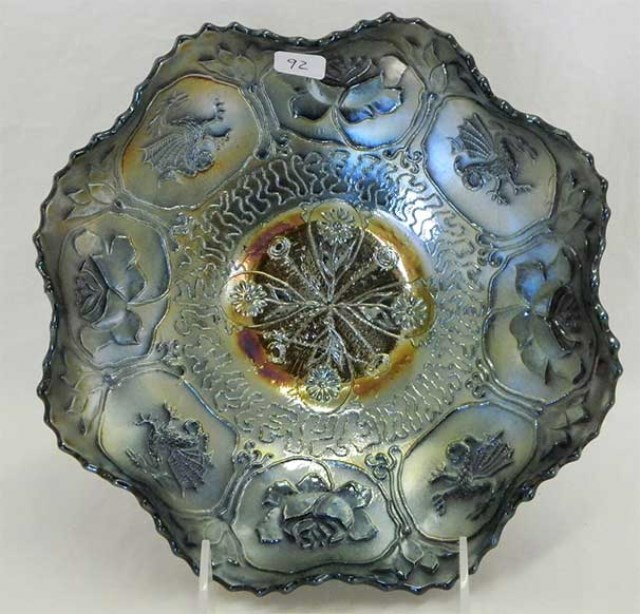 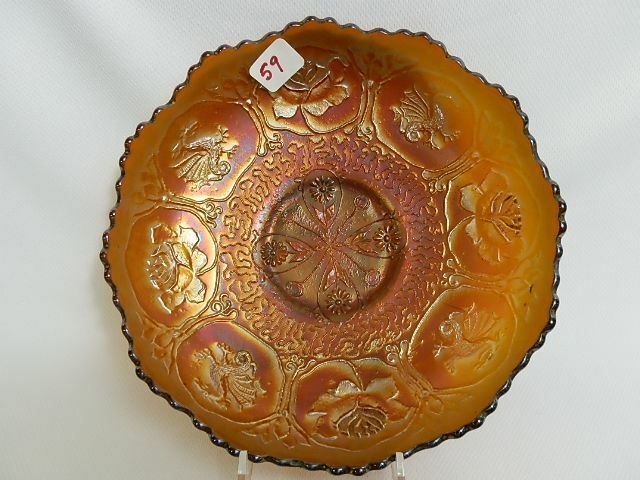 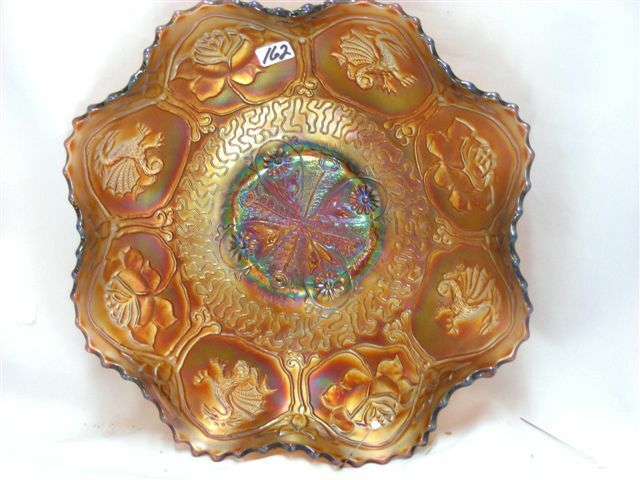 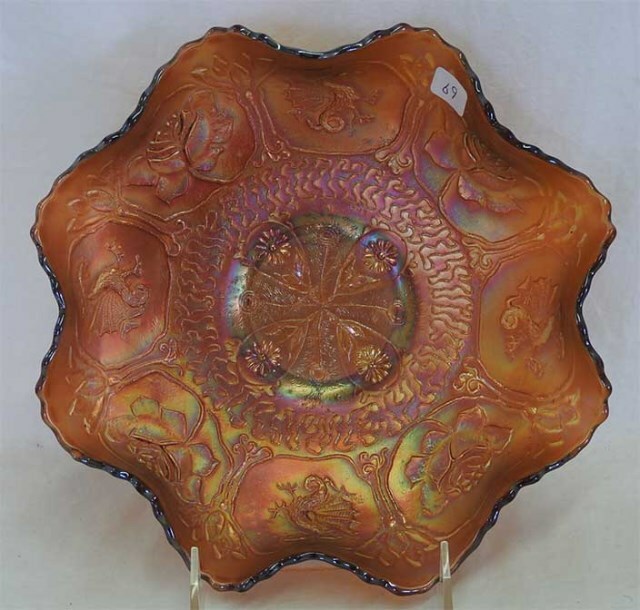 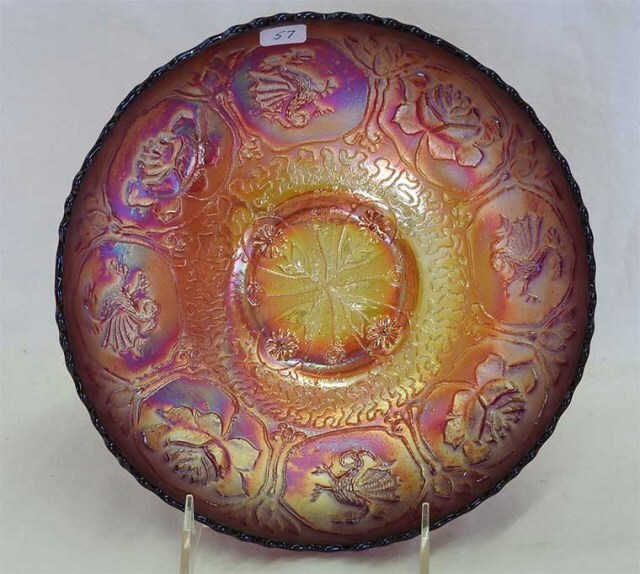 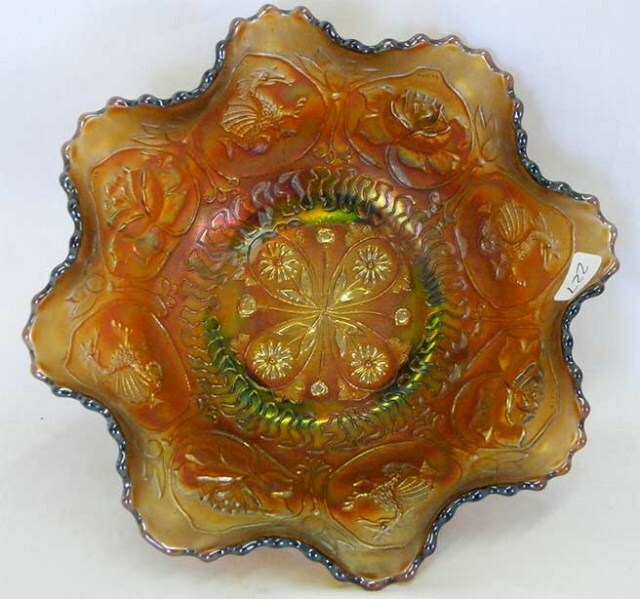 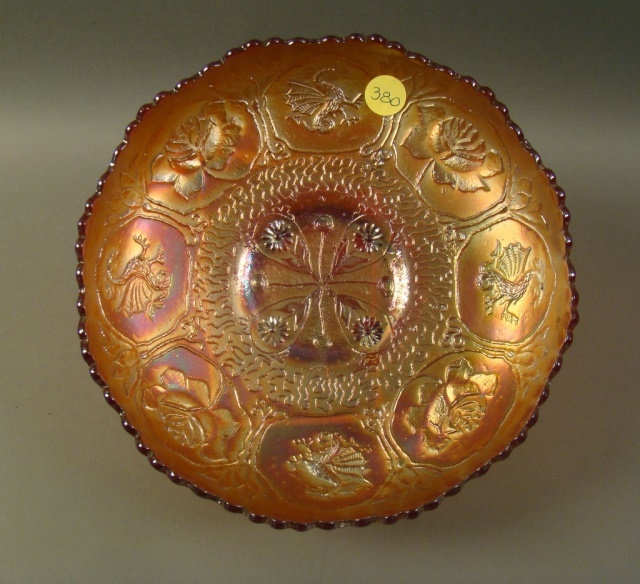 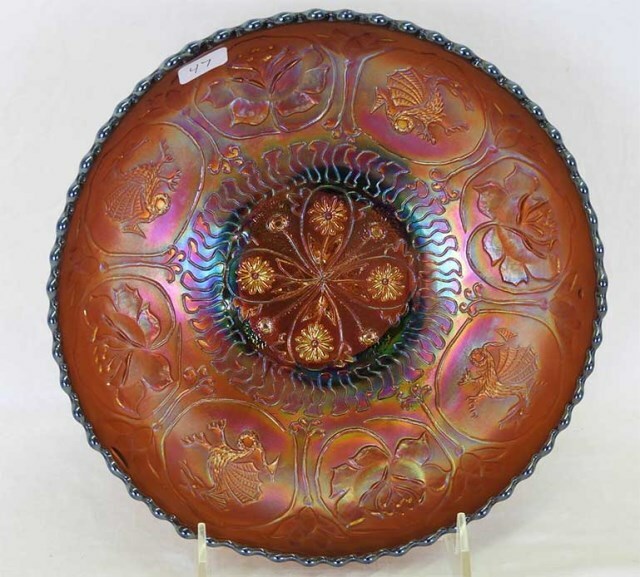 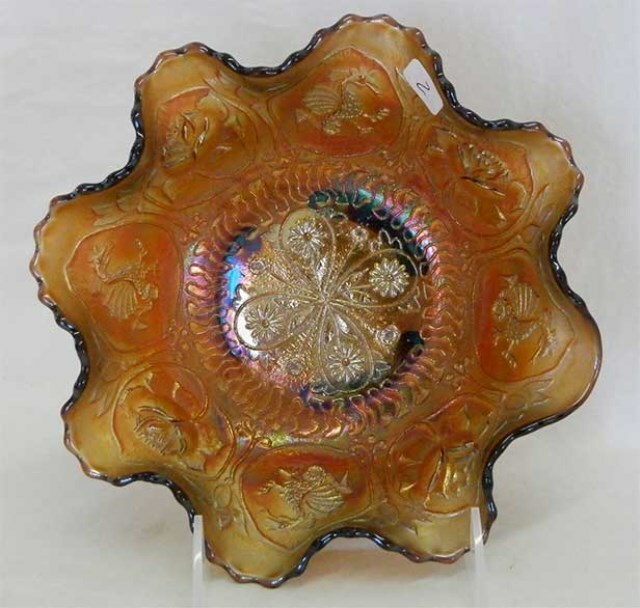 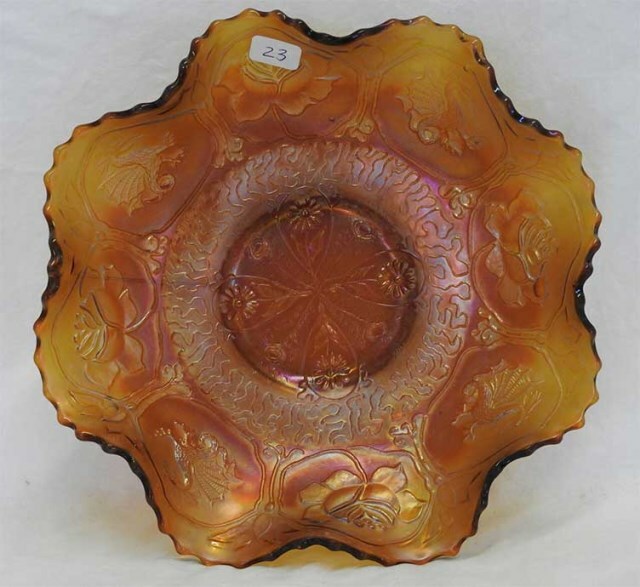 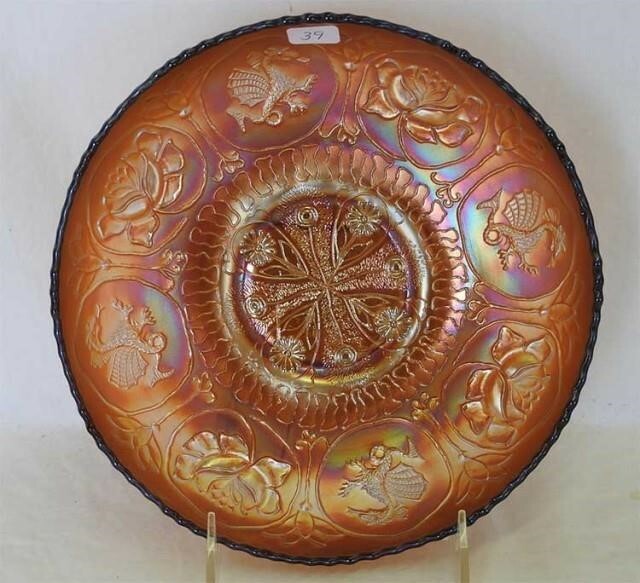 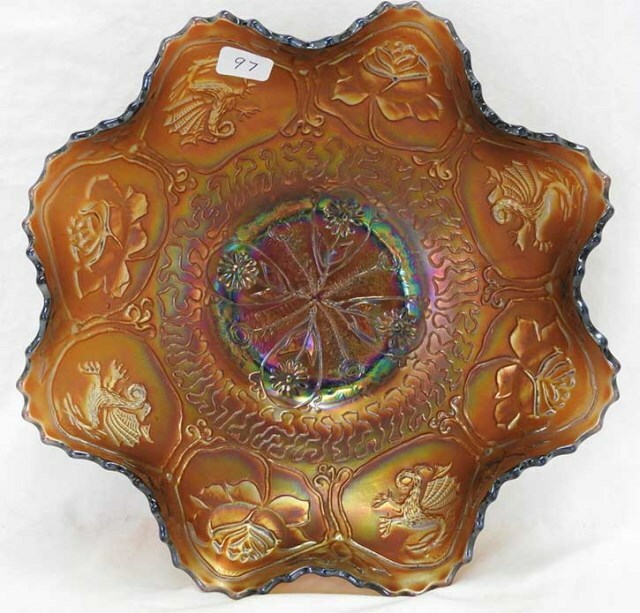 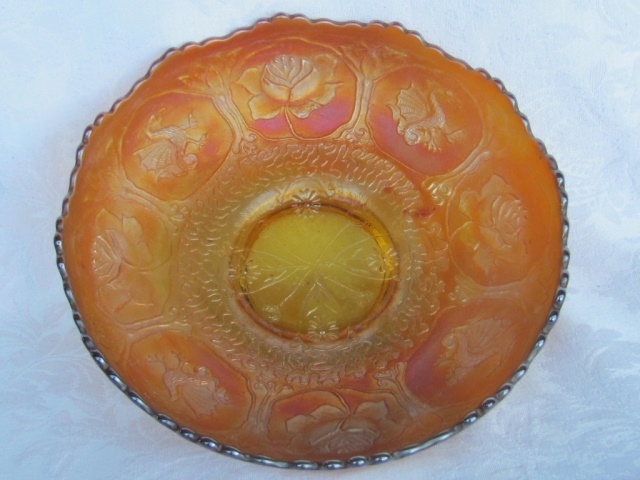 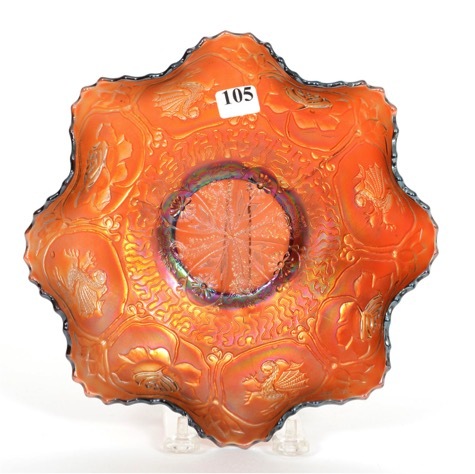 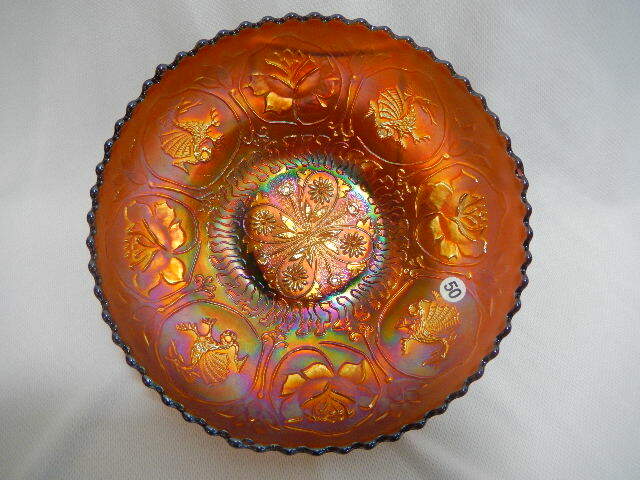 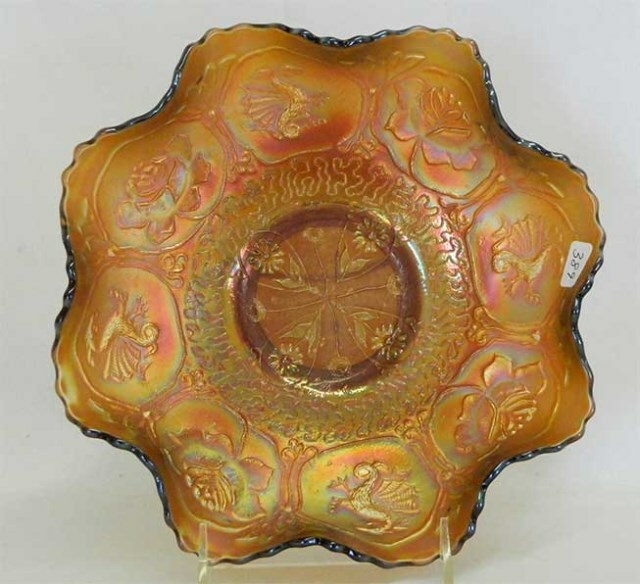 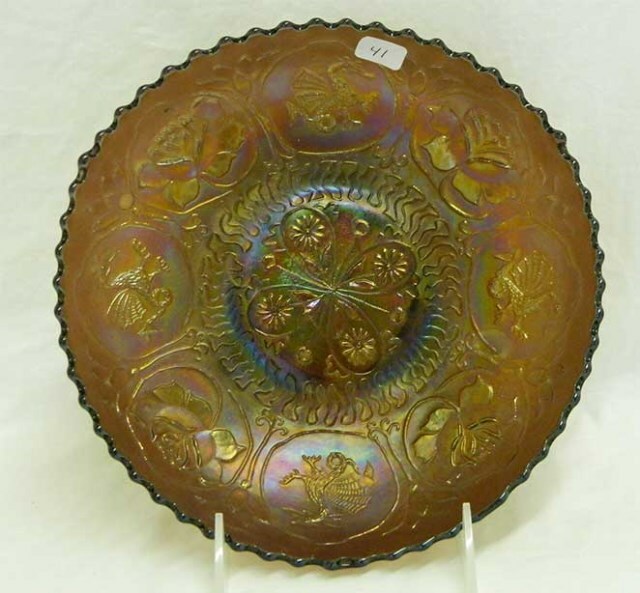 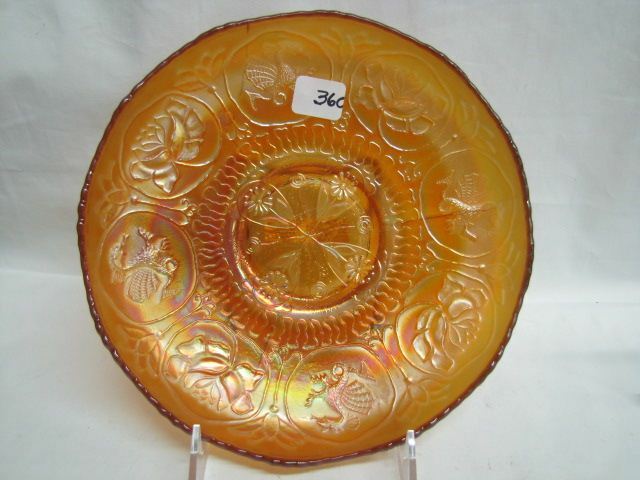 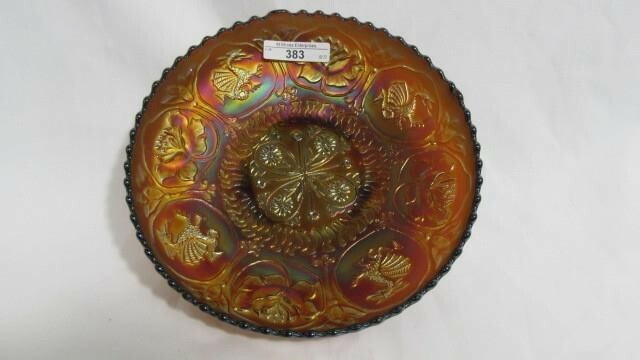 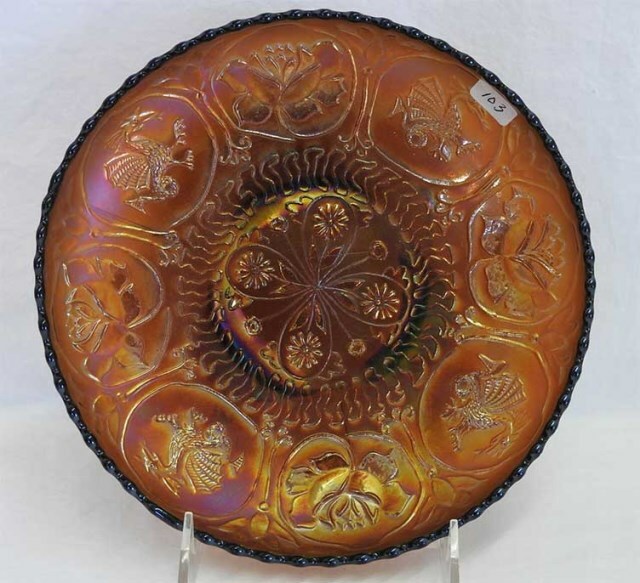 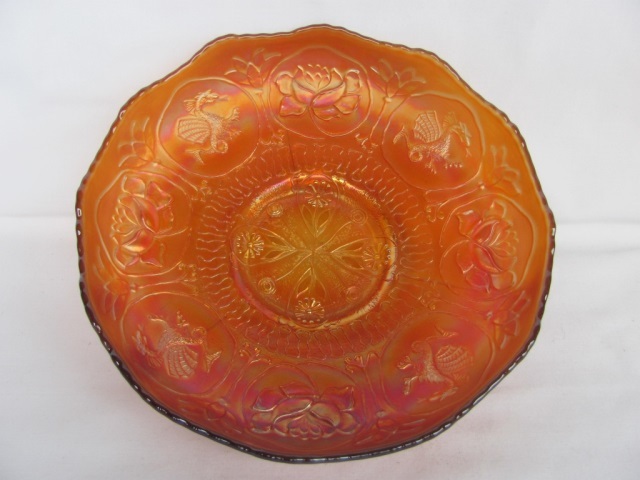 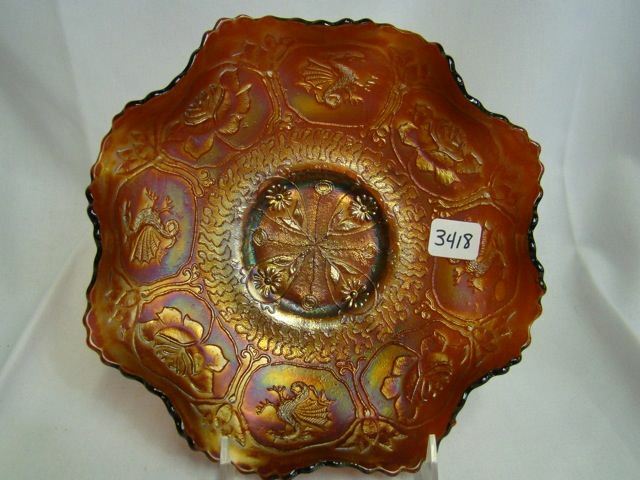 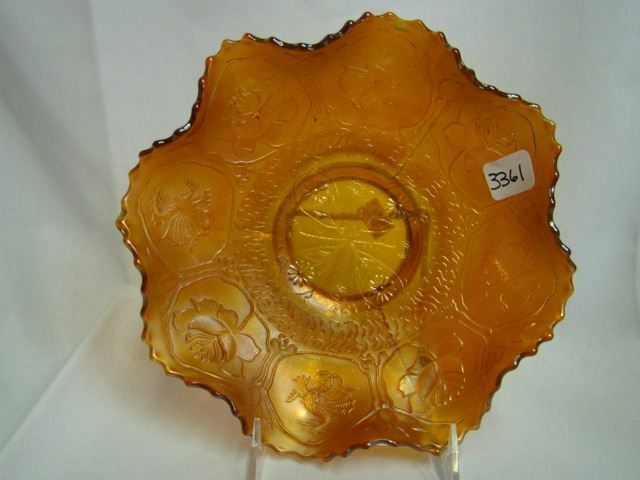 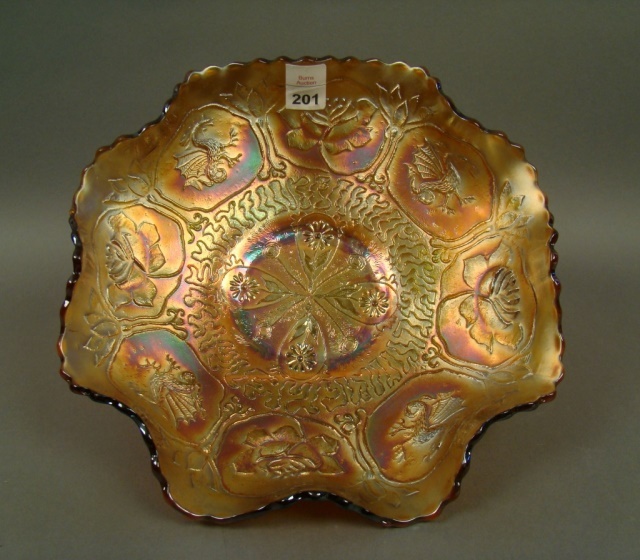 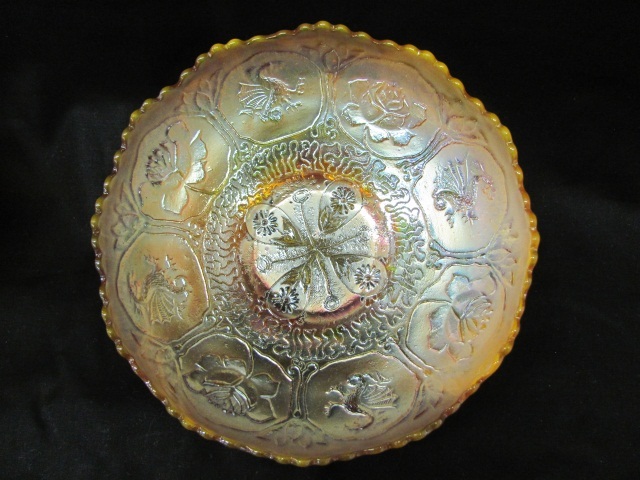 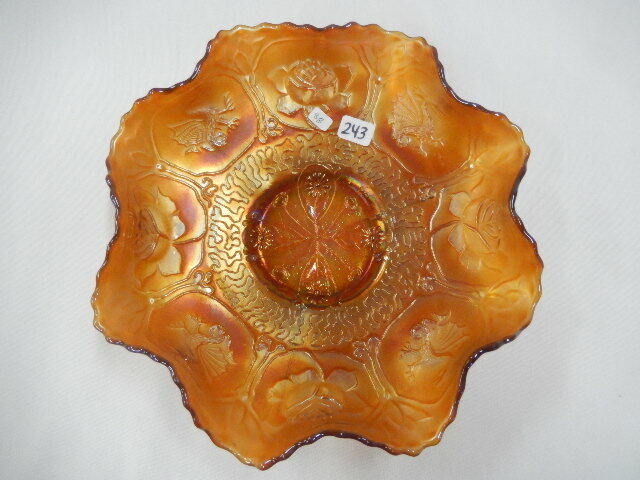 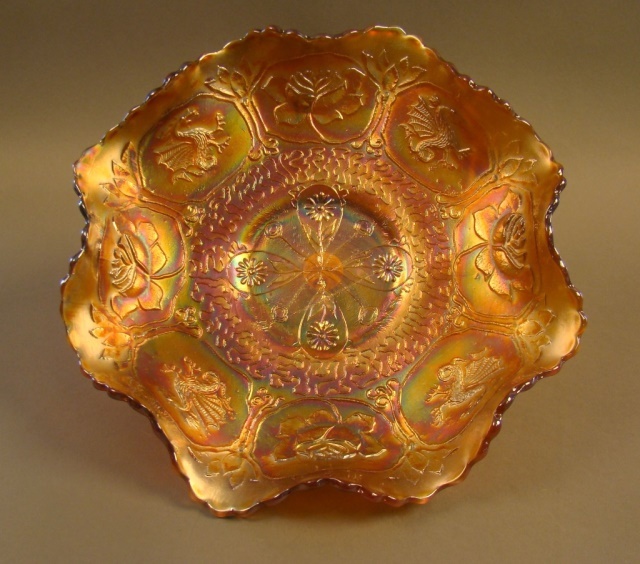 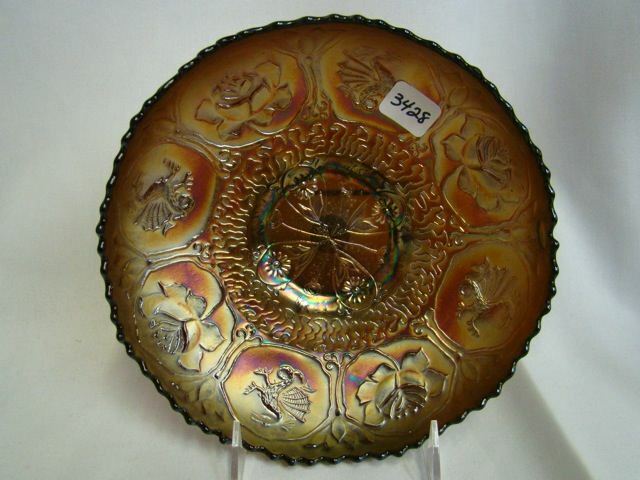 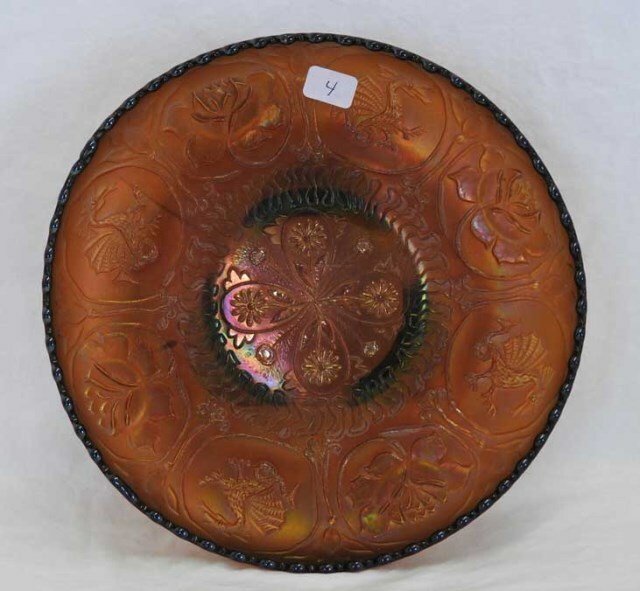 In May of 2004, Richard Thorne added that he has a spatula-footed marigold plate, an amethyst plate (possibly 3 or 4 known), and reports 3 or 4 plates in peach opal. 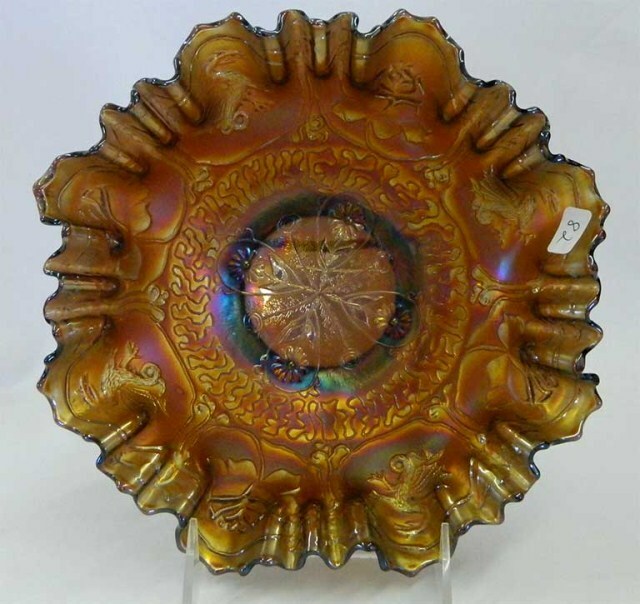 He has two of the yellow opal slag bowls. 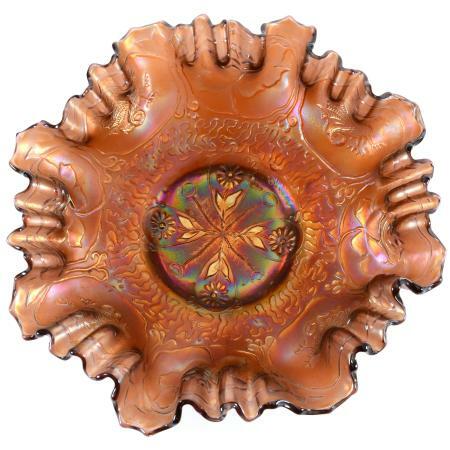 He further says, “Another interesting aspect of Dragon and Lotus is that there are several varieties of non-iridized bowls. 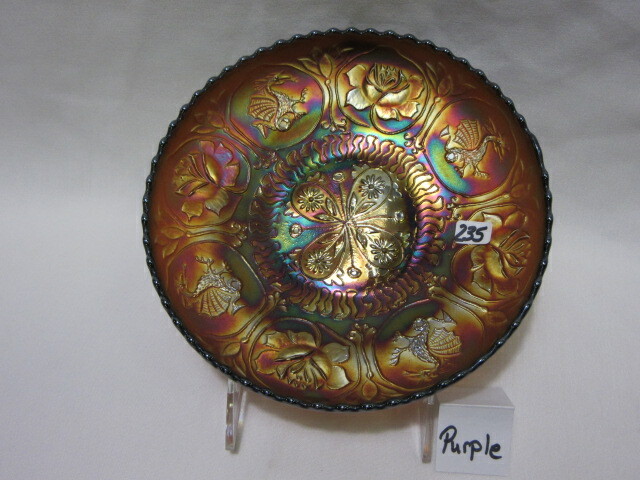 They are more common in pink and green depression. 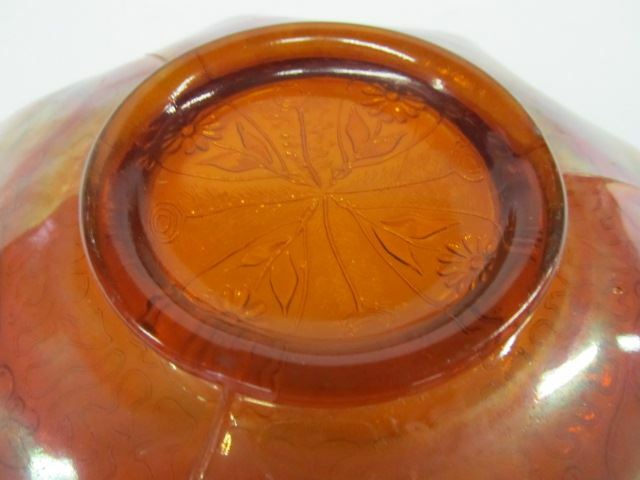 But also known in red, blue and white (or clear), as well as a root beer color. 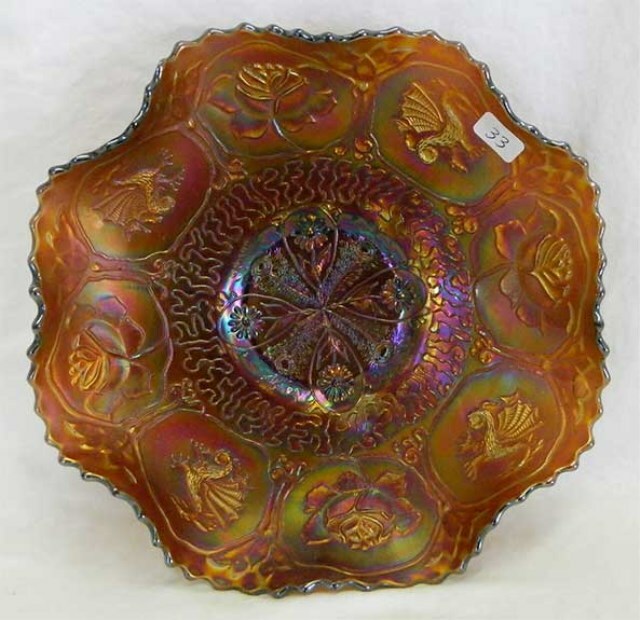 Dragonlady Ardonna Bucher has kindly agreed to share some of her Dragon and Lotus rarities with us. 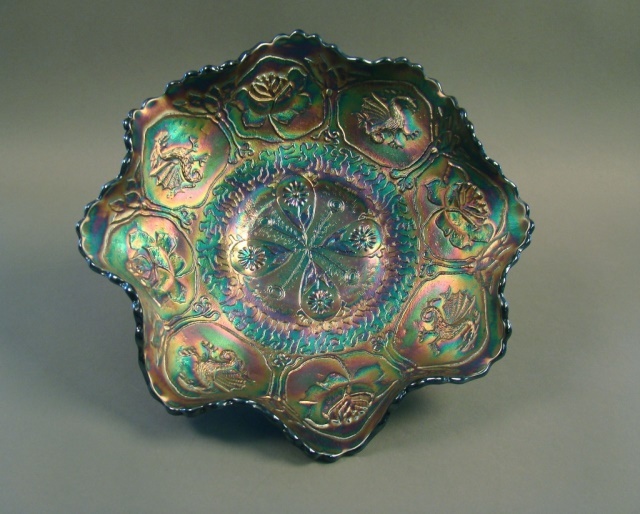 Left is an ice cream shape in aqua opal, middle is an ice cream shape in blue opal, right is an ice cream shape in white.